Audio Kit is a collection of four tools which are essential for those working in audio, sound and music. A real time Spectrum Analyser, a Scope to display waveforms, an SPL (Sound Pressure Level) Meter, and a Signal Generator producing sine waves, white noise and pink noise. Sweep generation with In App Purchase. Three FFT sizes of 8192, 4096 and 2048 are selectable, giving fine resolution of frequencies. Interpolation gives resolution to within 1Hz. The display of the Scope can be adjusted easily using pinch gestures in both horizontal and vertical directions. Zero crossing detection of the waveform provides a smooth display and can be set to either positive or negative direction zero crossing. 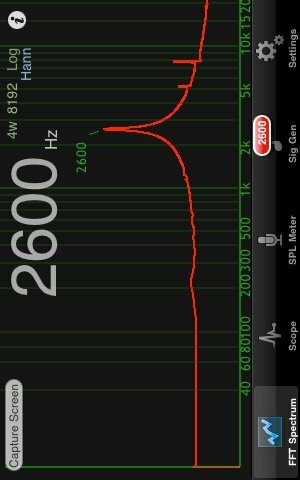 â€¨The SPL Meter continuously displays the sound pressure level using an A-weighting, and has resettable minimum and maximum displays also. SPL Meter can be calibrated against a reference standard or meter. With an In App Purpose one can add a sine wave sweep generator functionality to the Signal Generator. The sweep generator can sweep increasing and decreasing frequencies, and using either a linear or log sweep rate. Audio Kit - essential for those working in audio, sound and music.